You can set your address, phone number, email and site description in the settings tab. Link to read me page with more information. The idea for this performance comes from a conversation with our gracious host and homeowner about the site's history and her own history in the house. From this conversation came two stories: one about the death of a previous owner at the hands of his abused children and the other personal story where Lisa and Vivian attend a candlelight vigil for two slain teenage women the first week they move to Rose Hill. Since then I've been thinking about the performance of vigils, in the company of strangers or by oneself, for those we may not know. I should also mention I was drawn to the bougainvillea that dominates the gate and patio. Bougainvillea is known to Chamorros like myself as *Puti Tai Nobiu, *which translates to "It hurts not to have a lover". I thought it appropriate to use Flora Baza Quan's song that shares the same name as soundtrack and invitation during the performance to dance the Cha-Cha with me when prompted. This act, I hope, becomes a melodic act of respect and thoughtfulness to all the souls present on the property. 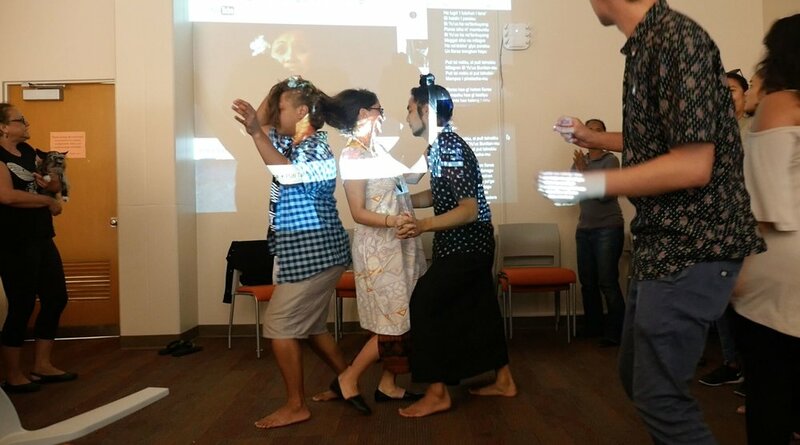 The following are photos from a workshopping of the piece during Tongva: Transcribing Spaces, some shots from rehearsals and the transcription of Puti Tai Nobio by my beloved mother, aunt and cousin. Perhaps I can look forward to dancing with you this Saturday. I hope this helps. I don't think it makes any sense. But we tried. a tree full of flowers. It hurts not have a lover, Oh it hurts not to have a lover. Your loyalty was one of Gods miracles that attracted every ones attention. (Mit di hao kalang i Ninu) ? ? ? Flower of no lover, how our stories are so much alike. I wouldn't be suffering like this. I am envious of you, a flower without a lover. But if I should consider, I'll think about it. Why do they always look for you?